I like being understood when I speak. The problem is, I speak in allusions, so half the time no one understands what I’m saying. Because they don’t absorb pop culture the same way I do. Not that there’s anything wrong with that. The other issue is that I use certain phrases that make sense only to me. And the select group of people who have the misfortune of being my close personal friends. I can’t fix the allusions thing without resorting to a Clockwork Orange approach that is, frankly, illegal. 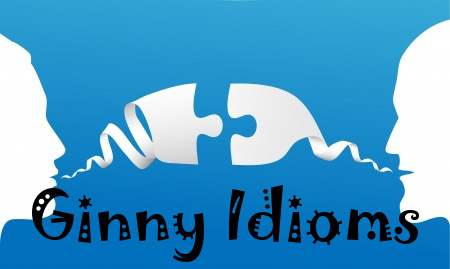 What I can do is share with you my particular peculiar sayings- my Ginny Idioms if you will- and their meanings. That is literally all I want for Christmas. So, I say literally like a lot. Literally like a lot. And I almost always use it properly. 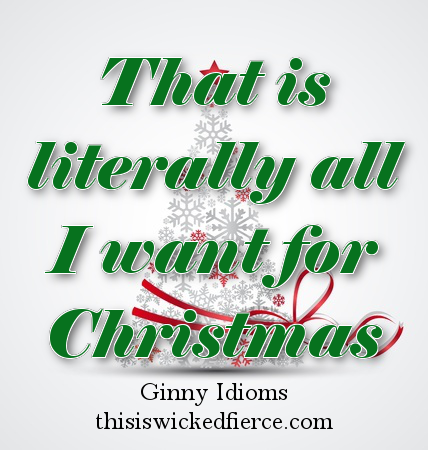 The one time that I know, for certain, that I’m using it wrong is when I say “That is literally all I want for Christmas.” Because between August and December 25th, I will say this literally over one hundred times. And that time I was using the term literally right. (And then when it became clear that wasn’t going to happen) Someone to review Min. I should clarify, this isn’t always an exact quote. It has many variations. That’s literally the only thing I want for Christmas. If I got that for Christmas, I would die happy. If you get that for me, I won’t need anything for Christmas. Buy me a pony or I’ll cut you from nose to trinkets. Most often though, I’m literally going to tell you that this is literally all I want for Christmas. And I don’t even know if I mean that figuratively anymore.